punjabi dal recipes, punjabi kadhi recipes. An Indian meal is never complete without dals and kadhi. They are an important component of the balanced meal and provides with the nutrition required for proper development. Different states have different homely ways of cooking dal, but most of these are quick and easy to prepare so they can be prepared without much ado on a routine basis. Dals are made of pulses or lentils while Kadhi is made using curd. Delicious dals and kadhis also hold an important place in Punjabi meals. Enjoy a bowlful of hot rice with satiating and homely dishes like Dal Amritsari and Panchratni Dal. Dal Tadka is the most basic dal preparation made using masoor and yellow moong dal. You can even use any other lentil to prepare this dal, the flavor depends upon the tempering. The rich and creamy dal tempered with ghee tastes amazing with roti and rice. Nothing can be more satiating than a bowl full of Rajma curry and rice. This curry is a favourite in Punjab and very popular amongst all age groups. Another popular dal is Maa ki dal or Dal Makhani. Traditionally it is cooked on a low flame overnight and allowed to thicken. But nowadays it is made using a pressure cooker. A preparation of curds, besan, onions and masalas the Punjabi kadhi takes no time to cook. An addition of pakoda intensifies the flavor and makes Punjabi Pakoda Kadhi an irresistible treat. 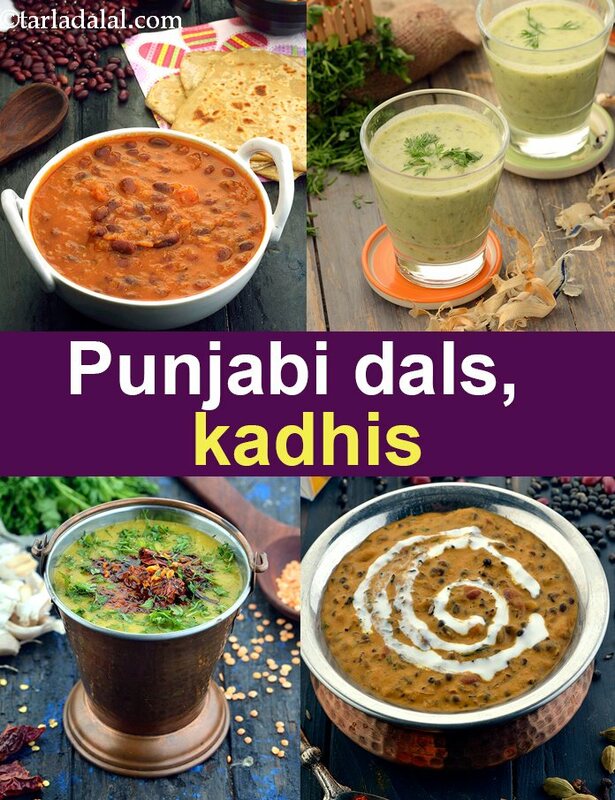 Enjoy our Punjabi Dal recipes, Punjabi Kadhi recipes. We have Punjabi Recipe articles below for you. If dal is soaked in water for sometime it cooks faster. serve it with kadhi or plain yoghurt. Sanjeev's Dal Makhni is a the popular Punjabi lentil preparation with split black urad dal. A rich and creamy dal recipe, dal Makhni is a favorite North Indian dal preparation and is best relished with paranthas and pickle. Discover the wonderful taste of different dals in this mixed dal recipe. The lentils ad to the texture of this dal recipe and can be enjoyed with both rice and roti. Enjoy the lovely combination of different lentils cooked with spice powders in the Mixed dal recipe. The thick dal is best enjoyed garnished with chopped coriander leaves with rotis or parathas.